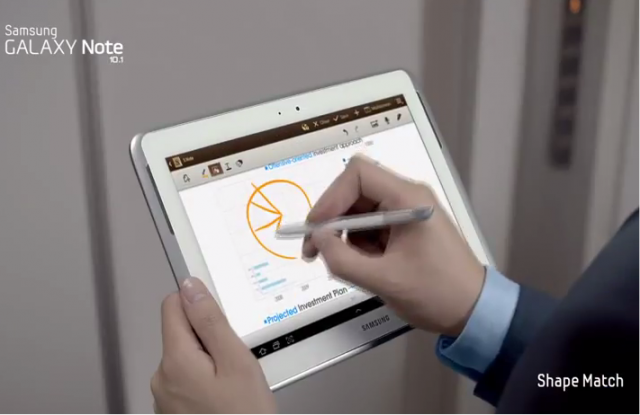 Samsung to debut an eight-inch Galaxy Note tablet at MWC? Samsung is no stranger to obscure product sizes; from the 7.7-inch Galaxy Tab to the 5.5-inch Galaxy Note there is a device for every demographic. After introducing the world to the Galaxy Note 10.1 last year, the company is seeking to make magic happen twice with a new eight-inch Note tablet set to debut at Mobile World Congress next month. We’ve seen evidence of the device on benchmark sites, but according to SamMobile the product is all set for mass distribution. Unfortunately, it looks that Samsung isn’t pushing any performance boundaries with this upcoming Note 8.0, particularly in the screen resolution department. Rumoured specs give it a resolution of 1280×800 for a paltry pixel density of 189ppi. While the exact processor isn’t known, it’s likely to be a home-grown Exynos chip, along with 2GB of RAM and either 16 or 32GB of internal storage. There will be a 5MP camera on the back, a 4600mAh battery inside and Bluetooth 4.0 to go along with the requisite WiFi and USB connections. According to SamMobile, the tablet’s dimensions are 211.3×136.3×7.95 mm and 330 grams, which would put it in the thin-and-light department, but we’ll take all these numbers with a pinch of salt for now. For comparison’s sake, the Galaxy Tab 7.7 has dimensions of 196.7 x 133 x 7.9 mm. Of course, there will be a S Pen included with the Galaxy Note 8.0, and we’d expect to see an updated version of TouchWIZ to accompany Android 4.2. It’s great to see Samsung accommodating so many market segments, but we hope they address the claims of poor build quality and buggy software levelled at the Note 10.1 before bringing its diminutive sequel to market.